You Got Your Bubblegum In My Incense! It’s 1971 and you are the average American music-loving eight year old. You and your best friend are in your room listening to your Banana Splits and Partridge Family records. You wish that you could see them performing or at least watch an episode of their shows, but those air on Friday and Saturday, and it’s only Monday. These are the days before cable TV, the VCR, music video, and DVD’s. Suddenly your friend presents before you a bright red and white plastic toy that somewhat resembles a small pair of binoculars. You watch as your friend inserts a circular cardboard disc, with tiny bits of film embedded around the edges, into a slot at the top of the unit and then pulls down a lever on the side, which promptly springs back up. It is then passed to you. You hold it up to the light and peer inside, and suddenly you are inside The Banana Split’s groovy pad singing along with the fuzzy foursome. Does this stir memories? Probably just about anyone you know has at one time or another in their life, stared into one of these magical curios called A View Master. A Successor to the more primitive 19th century stereograph, the View Master was developed in 1939 and was manufactured by Sawyers. Since then over one billion different 3-D stereoscopic reels have been produced, covering a myriad of topics such as historic sites, foreign countries, religious, theme parks, children’s stories, movies, promotions for retail products and even military training reels created for the U.S. armed forces. In 1966 the View Master Product line was sold to the GAF Corporation who began to shift the focus of production more towards the sports, juvenile, cartoon and entertainment genres. By 1967 rock music was being purchased by a younger audience than ever, and the time was ripe for the merging of 1960’s pop culture, the pre-teen market and the View Master reel. The first band to be given the 3-D treatment were The Monkees, who themselves were pioneers (and/or victims) of the manufactured “rock band as commodity” mass-marketing approach. View Master shot film in the late summer of 1967 on The Monkee’s set as they filmed the “Hillbilly Honeymoon” episode of their second TV season. The resulting three-reel set came packaged with a small booklet. View Master adapted their own version of the episode’s script for the booklet and re-titled it “Last Wheelbarrow To Pokeyville”. Two of the most dazzling 3-D pictures in the set show The Monkees in their famous Monkeemobile as they arrive in a western town. Two years later during the peak of the bubblegum music craze, View Master landed the licensing to produce reels of the latest pre-teen musical group, The Banana Splits, whose character’s personalities were loosely based on those of The Monkees. 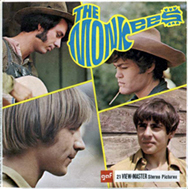 The members were made up of a gorilla, a lion, a beagle and an elephant, and like The Monkees, they had their own TV series and records. This three-reel set, as with most other GAF-era sets, came with a booklet. The colorful sound stage used for the TV show looks even more psychedelic with the 3-D effect. The next wave of multi-media pop-group marketing came in 1970 with the creation of The Partridge Family. The fictional singing group from San Pueblo, California was Hollywood’s answer to the real life singing family, The Cowsills. 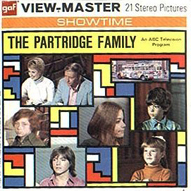 In 1971 View Master introduced a Partridge Family reel set based on an episode called “Partridge Up A Pear Tree”. The 3-D film was shot on the Partridge set towards the end of their first TV season. The positioning of the 3-D photographer reveals some things that couldn’t be seen on the television show. In one frame, the marks for the actor’s positions can be seen on the floor beneath their feet. An eye-catching image on the second reel shows The Partridges on stage in their well-known red velvet outfits performing “You Are Always On My Mind” from their second album. This set proved to be so popular that a second set titled “The Male Chauvinist” based on a third season episode, was produced in 1972. Both sets are very popular items among Partridge family collectors to this day. At this time a more obscure set was produced based on the TV series, “Lancelot Link-Secret Chimp” which featured the spy adventures of Lancelot Link and music from his rock group The Evolution Revolution. All of the parts on the show were played by chimps, with voices dubbed in by human actors. The show has taken on a sort of cult status and is still fondly remembered for its tongue in cheek homage to the spy show “Get Smart”. The Lancelot Link reels were part of View Master’s Talking View Master series which in addition to the 3-D images, were also able to reproduce sound via a tiny plastic record. The sets are fairly hard to find, although not as hard to find as the “Lancelot Link And The Evolution Revolution” album released on ABC records which is a classic slice of bubblegum. Meanwhile in Britain, The European-created group “The Wombles” became the subject of a View Master set. The Wombles, in some ways were Britain’s own version of The Banana Splits. They were costumed as a group of furry musicians who looked like a cross between a teddy-bear and an aardvark. Although The Wombles had a rather lengthy musical career in The U.K., only one LP, “Remember You’re A Womble” was released in The U.S. The Wombles View Master reels remained exclusive to Europe. 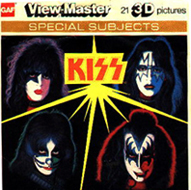 In 1979 the rock group Kiss became the next musical subject to be captured in 3-D. Again the package included three reels and a booklet. With their fire-breathing antics and glam-rock meets kabuki style make-up, Kiss was a perfect match for the 3-D format. The reels featured shots from their 1979 “Dynasty” road show. The following year saw two more music-related reel sets added to the View Master line. The first featured the group Cheap Trick and remains the rarest of the View Master sets of the musical genre. The second set featured disco sensations The Village People in scenes from their new movie “Can’t stop The Music”. In 1981 the View Master product line was sold again and the packaging was changed so that the reels were now on a blister pack while manufacturing of the accompanying booklet ceased. By 1984 Michael Jackson was the biggest musical star on the planet, so a pairing with View Master was a natural. Michael’s image was not new to View Master having been featured as the scarecrow in View Master’s 1978 “The Wiz” set. Now he was being featured in a set of his very own, based on his mock-horror video for “Thriller”. Kids could see a Zombie version of Michael with bright yellow eyes, reaching out through the viewer at them while they listened to one of the 40 million copies of the album. A “Thriller” set with sound was also produced for the Talking View Master line. The Michael Jackson reels sold well, so a follow-up was planned. View Master sent a 3-D photographer to film The Jackson’s July 23rd concert at the Gator Bowl in Jacksonville during their 1984 “Victory” tour. Unfortunately the reels were never produced. Before the year was out though, there was one more addition to the line of pop music reels, the now much sought-after Van Halen reel set. 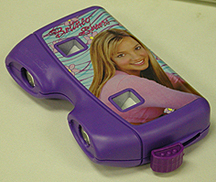 In 2000 Britney Spears became the next pre-teen musical idol to be viewed in 3-D glory. Her set came packaged in its own exclusive Britney viewer and featured eighteen images taken on stage during one of her shows. Already, this set is becoming elusive. In 2003 the Ohio band The Pillbugs became the latest musical artist to go 3-Dimensional in their very own View Master reel. Packaged exclusively with their CD “The 3-Dimensional In-Popcycle Dream” The reel features images of the band in their psychedelic recording studio, lounging in a grassy field, playing in the snow and more. So now it’s 2003 and you are the average music-loving eight year old. You are in your room with your best friend listening to your Hillary Duff and John Mayer MP3’s and watching their DVD’s you picked up at the mega-mart… View Master reels almost seem like a quaint novelty in an age of computer games and surround sound DVD’s. Yet the appeal of the 3-D viewer seems to still be in-tact. View Master products are now produced by Mattel as part of their Fisher-Price line. The majority of reels being produced are Juvenile subjects and nature-themed sets produced in conjunction with the Discovery Channel, plus cartoons, and of course, as always, the latest Disney feature. Maybe someday we’ll even get to see those Jacksons concert reels.